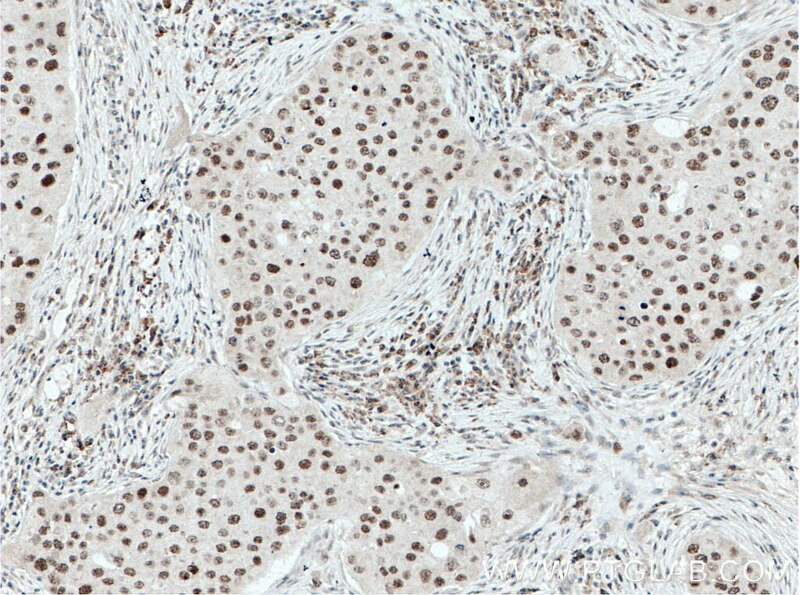 Immunohistochemical analysis of paraffin-embedded human liver cancer tissue slide using 66525-1-Ig( HMGB1 antibody) at dilution of 1:500 (under 10x lens) heat mediated antigen retrieved with Tris-EDTA buffer(pH9). 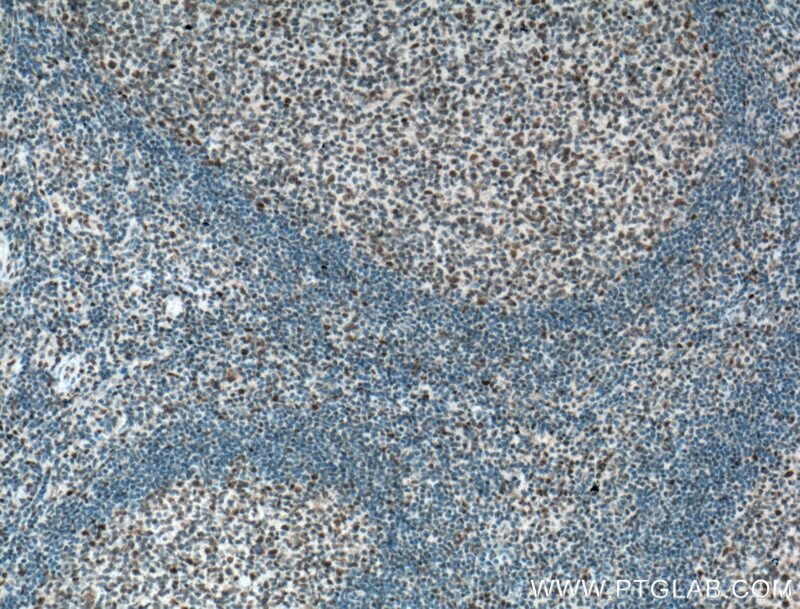 Immunohistochemical analysis of paraffin-embedded human liver cancer tissue slide using 66525-1-Ig( HMGB1 antibody) at dilution of 1:500 (under 40x lens) heat mediated antigen retrieved with Tris-EDTA buffer(pH9). 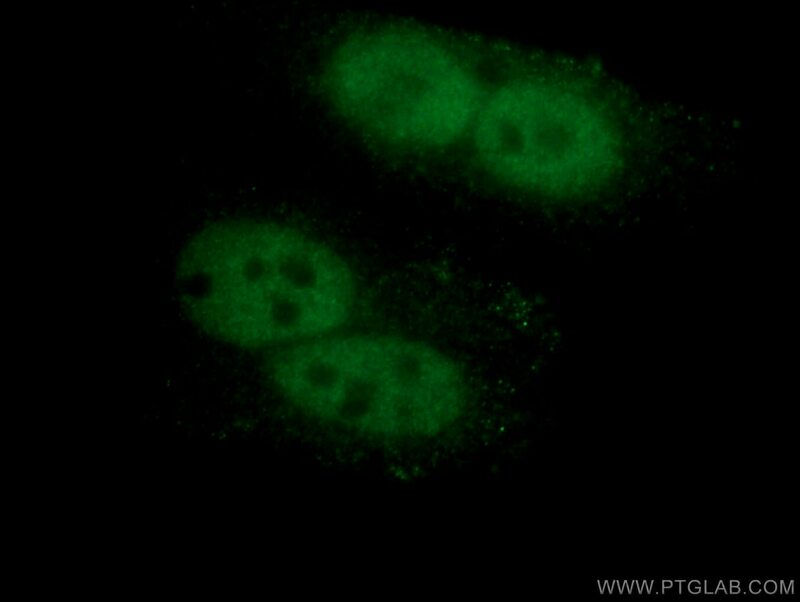 The HMG (high mobility group) proteins are nonhistone chromosomal proteins that is present in almost all eukaryotic cells, and it functions to stabilize NUCLEOSOME formation and acts as a transcription-factor-like protein that regulates the expression of several genes[PMID: 18160415]. 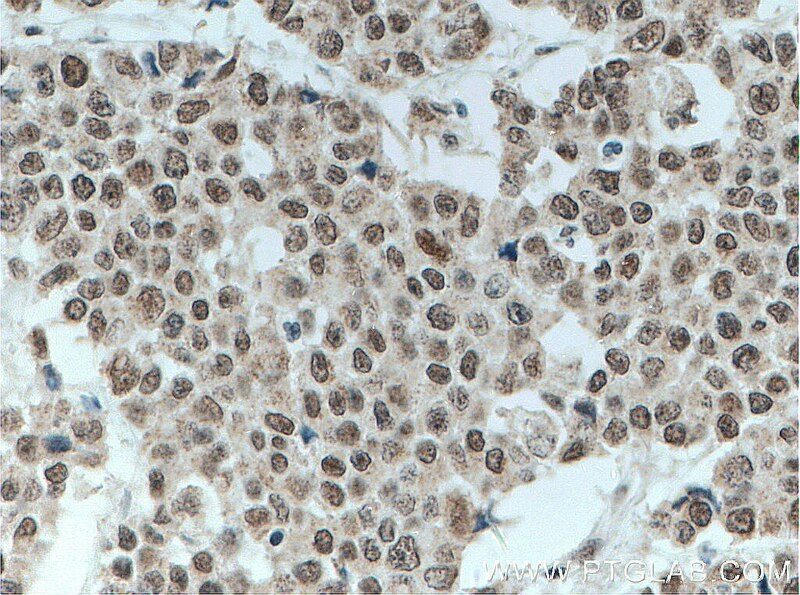 Once injury, infection or other inflammatory stimuli, activated macrophages, mature dendritic cells and natural killer cells can secret HMGB1, which act as a crucial cytokine[PMID: 20163887]. HMGB1 also involved in V(D)J recombination by acting as a cofactor of the RAG complex, stimulating cleavage and RAG protein binding at the 23 bp spacer of conserved recombination signal sequences (RSS)[PMID: 19360789 ]. Act as a Heparin-binding protein that has a role in the extension of neurite-type cytoplasmic processes in developing cells. HMGB1 (high mobility group box 1) modulates gene expression in the nucleus, but certain immune cells secrete HMGB1 as an extracellular Alarmin to signal tissue damage.The nuclear HMGB1 relocalizes to the extracellular milieu in senescent human and mouse cells in culture and in vivo, which stimulated cytokine secretion through TLR-4 signaling (23649808).This antibody is raised against full length HMGB1 of human origin. The monomeric HMGB1 is 29 kDa and dimer is 58 kDa. 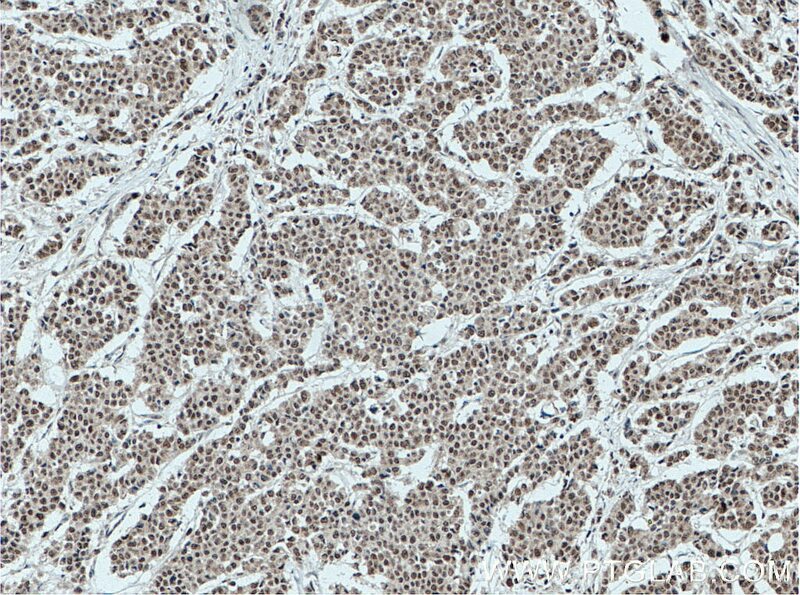 Immunohistochemical analysis of paraffin-embedded human breast cancer tissue slide using 66525-1-Ig (HMGB1 antibody) at dilution of 1:500 (under 10x lens) heat mediated antigen retrieved with Tris-EDTA buffer(pH9). 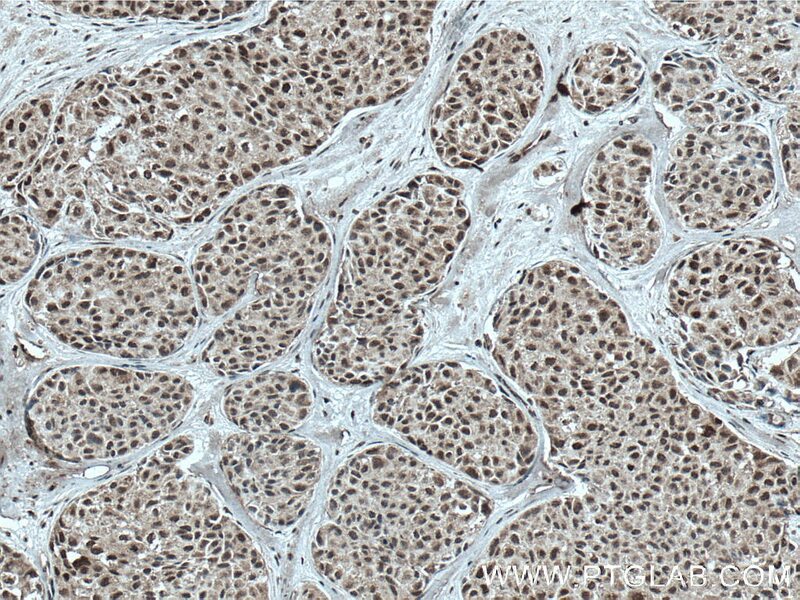 Immunohistochemical analysis of paraffin-embedded human breast cancer tissue slide using 66525-1-Ig (HMGB1 antibody) at dilution of 1:500 (under 40x lens) heat mediated antigen retrieved with Tris-EDTA buffer(pH9). 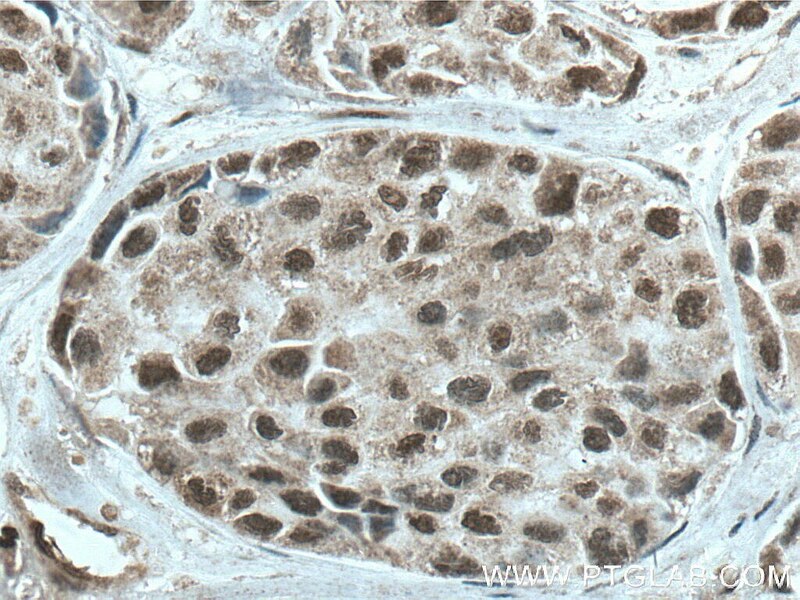 Immunohistochemical analysis of paraffin-embedded human colon cancer tissue slide using 66525-1-Ig (HMGB1 antibody) at dilution of 1:500 (under 10x lens) heat mediated antigen retrieved with Tris-EDTA buffer(pH9). 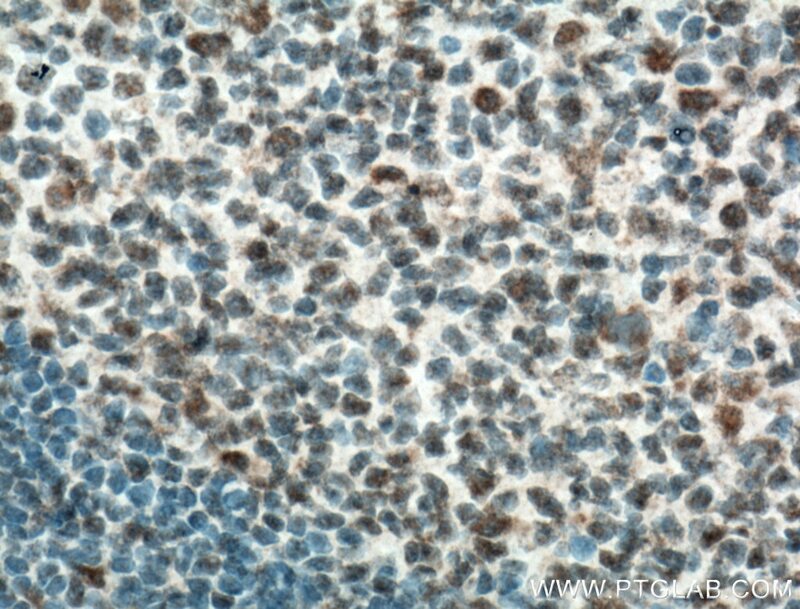 Immunohistochemical analysis of paraffin-embedded human colon cancer tissue slide using 66525-1-Ig (HMGB1 antibody) at dilution of 1:500 (under 40x lens) heat mediated antigen retrieved with Tris-EDTA buffer(pH9). 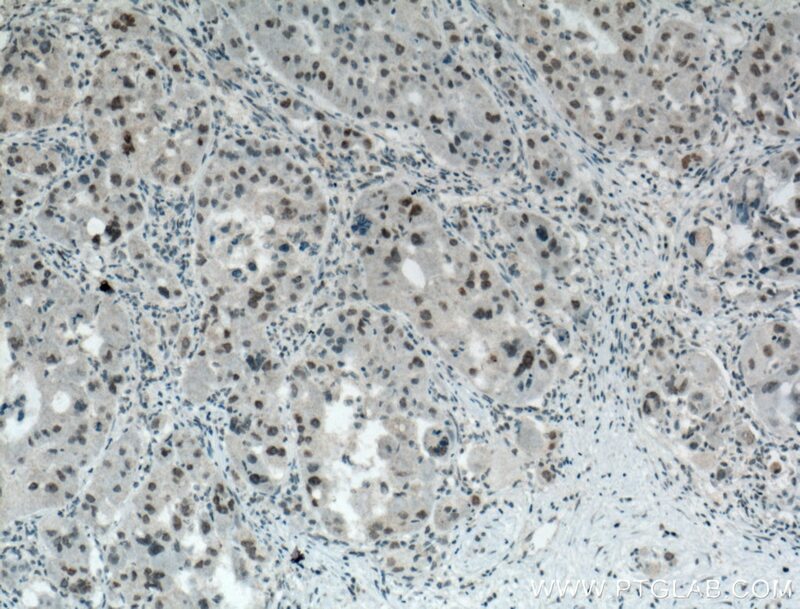 Immunohistochemical analysis of paraffin-embedded human lung cancer tissue slide using 66525-1-Ig (HMGB1 antibody) at dilution of 1:200 (under 10x lens) heat mediated antigen retrieved with Tris-EDTA buffer(pH9). 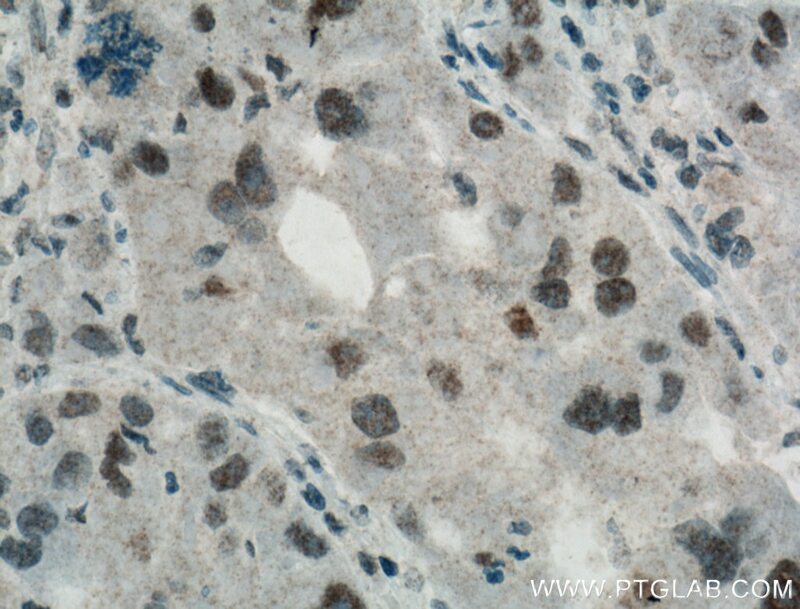 Immunohistochemical analysis of paraffin-embedded human lung cancer tissue slide using 66525-1-Ig (HMGB1 antibody) at dilution of 1:200 (under 40x lens) heat mediated antigen retrieved with Tris-EDTA buffer(pH9). Immunohistochemical analysis of paraffin-embedded human tonsillitis tissue slide using 66525-1-Ig( HMGB1 antibody) at dilution of 1:500 (under 10x lens) heat mediated antigen retrieved with Tris-EDTA buffer(pH9). 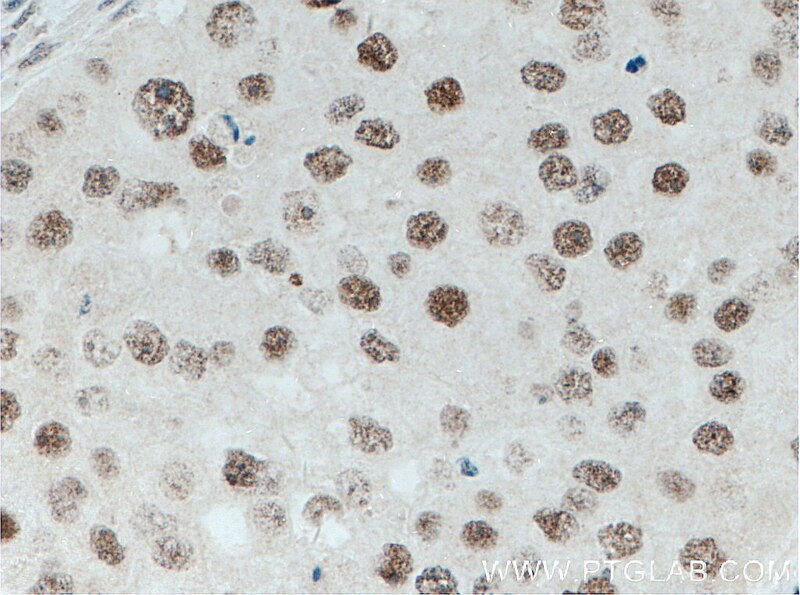 Immunohistochemical analysis of paraffin-embedded human tonsillitis tissue slide using 66525-1-Ig( HMGB1 antibody) at dilution of 1:500 (under 40x lens) heat mediated antigen retrieved with Tris-EDTA buffer(pH9).